The massive iron doors opened into the grand hall of Farsten Hammerfist, clanlord of the Hammerfist Dwarves. His council of advisors stood nearby as the heroes were welcomed into the hall. As the heroes came to stand before Farsten Hammerfist, the council members bowed respectfully to the assembled heroes from Bear’s Head. For indeed, the dwarves of Hammerfist Hall owed much to those from the town in the Western Vale. It was not that long ago that another group of heroes from Bear’s Head fought bravely against the forces of the Winter Witch who had imprisoned the clanlord and countless other dwarves in her icy embrace, while she forced others to work in the mines. Thanks to those brave heroes, the Winter Witch was slain and would never threaten the Sunset Mountains again. And now, something entirely new threatens the short-lived peace in the Sunset Mountains and perhaps even those who call the Sunset Vale, home. It seemed giants have returned to their ancestral lands in the Far Hills and the southern Sunset Mountains. To make matters worse, hill, stone, frost, and fire giants have seemingly banded together for a common cause. 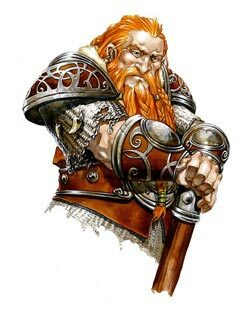 The Hammerfist dwarves fear that the giants may be planning to strike against the dwarves and may even launch an attack against the civilized folks of the Sunset Vale. Clanlord Farsten Hammerfist has asked the heroes of Bear’s Head for help. He believes the hill giants, stone giants, frost giants, and fire giants have hidden strongholds in the mountains. He asked them to look for a map or some other clue that will reveal where these strongholds are located. He and his council have also wondered how the hill giants could have gained in strength and power so quickly since their recent arrival. He suspects that the hill giants may have built their stronghold atop an old dungeon complex, within which is rumored to be an abandoned temple. He further asks the heroes to find this temple, explore it, and bring back proof of their discovery. Finally, the hill giants have captured several dwarves who were sent to scout the Far Hills and eventually meet with the Cormyrians in New Hluthvar. The dwarves had not returned at their appointed time, so the Clanlord sent a search party to locate the missing dwarves. The search party returned and reported that the dwarves had made it to the Far Hills and had obviously ran into a group of giants and their hireling—as the signs they discovered indicated. However, they did not find any of their lost kin leading them to believe that the dwarves had been captured. When they followed the trail deeper into the Far Hills, they met up with a small band of hill giants and ogres. The dwarves lost half of their group before they were forced to return to Hammerfist Hall. Farsten offered the heroes the sum of five hundred gold coins for each dwarf brought back home safely. The heroes then gathered their belongings and made their way down the mountain towards the Far Trail that led southwest to New Hluthvar and northeast towards Castle Aris in Cormyr. A grisly sight greeted the heroes as they came upon the trail late in the afternoon. They saw two upturned wagons in the middle of the trail. Casks and crates littered the area as well as several bodies of slain caravan guards, their bodies left to rot where they were killed. A lone horse lay dead in front of the closest wagon. Strangely, the other horses were missing. Flies buzzed around the area and the foul smell of decomposing bodies made it hard to breathe. Carefully, the group made their way towards the wagon. Caldreas kept to the northern side of the trail while the others stayed along the southern end. As the wizard reached the safety of a tree, he spotted something large hiding behind a tree just passed the ambushed caravan. He pointed towards the tree and called to the others. “There’s someone behind that tree!” Caldreas warned. Just then, two hill giants followed by eight bugbears charged down the trail from behind where the trail turned and was obscured by thick bushes and a copse of trees. Only Caldreas understood the giant’s command who was hiding behind a tree above the trail. “Kill them all!” it bellowed in the language of giants. “Spare no one!” It then hurled a rock at Lo-kag, but the rock fell short of its intended target. Lo-kag realized the giant’s throwing range was limited. Unfortunately, he also realized that he would have to risk getting struck by a rock if he was going to get in close and fight with his melee weapon. Therand moved in and took cover behind a large bush. He spotted the giant who just bellowed out something that sounded like a command. He fired and struck the giant in the arm. The giant yelled in pain as Therand’s arrow struck deep. The giant suddenly screamed again as a second arrow buried itself in the giant’s shoulder. Therand looked at where the second shot had come from. From across the trail, he spotted Dred who had just taken his shot at the giant as well. Both looked at each other, momentarily celebrating their skills in accuracy. A cacophonous cry of eight bugbears charging towards the adventurers from Bear’s Head suddenly tore through the air. “Here they come!” Caldreas yelled above the din of the bugbears’ charge. The moon elf mage began to recite words of power and moved his hands in a circular fashion. Within a breath’s passing, a small pinpoint of light appeared within the mage’s moving hands. The pinpoint of light became a small floating wisp of fire which then suddenly blossomed into a roaring ball of fire that brightly illuminated the mage and the surrounding area. Uttering a final magic word, Caldreas hurled the fireball towards the charging monsters where it exploded upon reaching the precise spot the mage focused upon. An intense conflagration blasted outward. Several bugbears and one giant caught in the fireball’s blast screamed as magical fire—born from the depths of the elemental plane of fire itself—washed over all unfortunate enough to be caught in the firestorm. When the smoke cleared, Caldreas saw that four bugbears had been killed, their charred remains were all that was left. The giant managed to survive the blast but was severely wounded in the attack. Lo-kag, taking advantage of the giant’s condition, charged right in and buried his greataxe into its stomach. The giant looked down upon the goliath and let out a fearsome roar. Lo-kag, too, roared a barbarian’s roar. With a powerful tug, he pulled his weapon free. He then spun and brought the greataxe to bear upon the giant’s exposed belly once more. Blood and innards burst outward as Lo-kag sliced the giant’s stomach wide open. Blood, mixed with innards, flowed out. The giant, too stupid to know he was already dead, looked at Lo-kag defiantly. Lo-kag saw the giant’s eyes roll back into its head. It then fell back, dead before it had even struck the ground. A nearby grunt stole the goliath barbarian’s attention momentarily away from the dead giant before him. A bugbear was coming at him, its spear leading the attack. An arrow’s point suddenly appeared out of its forehead. The bugbear fell forward, twitched once by Lo-kag’s feet then died. Lo-kag looked past the bugbear and saw Therand, the ranger, nocking another arrow a great distance away. Lo-kag heard a loud grunt behind him. He turned and saw the hill giant standing behind the tree above the trail raise a rock above his head. The giant took a step forward and was about to hurl the deadly missile when he faltered in his step. In his attempt to steady himself, the giant dropped the rock and bellowed what sounded to the goliath like a foul-mouthed giant’s curse. Before the giant could recover, an arrow fired by Dred suddenly buried itself in the giant’s right eye! It roared in excruciating pain, reached up to its face and yanked the arrow out. It screamed even louder and threw the blood-soaked arrow to the ground. A bugbear moved up to Lo-kag and tried to stab him with its spear. The goliath easily deflected the sttack while avoiding another bugbear’s spear-led charge. Caldreas, who was watching Lo-kag fend off two bugbears by himself, raised his arm, pointed a finger at one of the humanoids, and uttered a single word. A glowing missile materialized on the tip of the mage’s finger and flew unerringly at the unsuspecting bugbear. It struck the bugbear in the head, killing it instantly. Lo-kag, ignoring the remaining bugbear who attempted to strike him, charged at the nearest giant. A second giant was moving towards the goliath barbarian as well. Two of ’em, against me, Lo-kag thought. I like these odds! The nearest of the two hill giants—the one with the injured eye—brought its massive club down on Lo-kag who easily sidestepped it. Chunks of dirt and rocks blasted upward and outward from the club’s impact. Lo-kag had just managed to clear dirt from his face when he was struck by the other giant’s club—a tree trunk with sharpened limbs and banded with metal. The goliath was sent hurtling backwards to land on the ground, on his back, some ten feet away! Dred, maintaining his distance from the deadly battle between giants, bugbear, and goliath, took aim and fired at the giant he struck earlier. The giant screamed once again as Dred’s arrow struck the giant, this time near its remaining good eye. Meanwhle, Deb the halfling ranger, had arrived to see his friends fighting a battle against hill giants and bugbears. He had volunteered to reconnoiter the lands east of the Western Sunset Vale when the others left Bear’s Head to answer the Clanlord’s summon for help. While scouting, he ran into a small band of adventurers on their way to Elturgard after having stopped by the town of Asbravn. The adventurers spoke of how Asbravn—recently dubbed “Asgraven” because of the hordes of undead that had occupied the town—had been freed by a skilled and powerful group of adventurers who called themselves Faerûn’s Fantastic Four. Deb also learned that Faerûn’s Fantastic Four had established themselves as the town’s leaders, and were helping to restore the town. The halfling raised his bow and took two shots at a giant, hoping to help end the battle. Caldreas finished casting another spell and directed it one of the two giants fighting Lo-kag. In the giant’s mind, an illusion of its greatest fear took form and attacked it. To all others, it looked like the giant was battling some unseen foe. Lo-kag, still on the ground, reached into his backpack and drew out a potion of vitality and drank it. The pain in his chest, caused by broken ribs he was certain, began to fade. He saw one of the remaining bugbears rush towards Caldreas. The mage took a few steps back and casted another spell. Caldreas sent a magic missile slamming into the bugbear’s chest, which surprisingly did not kill it. Caldreas quickly called to mind another deadly missile which struck the bugbear full force in the face and then exited out through the back of its skull. “Nice work, Caldreas,” Therand yelled to the mage. He then aimed his bow at the remaining bugbear who stood by the fallen wagon. It seemed to be contemplating whether or not it shold run. Therand quickly put an end to all thoughts of escaping by burying an arrow into its chest. It slumped against the wagon and slid down to the ground where it died seconds later. 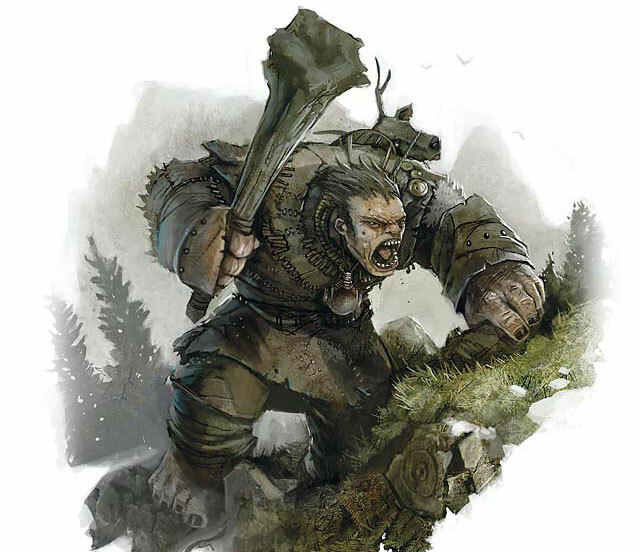 The ranger then ran to the wagon and looked towards where Lo-kag was busy fighting for his life against three hill giants intent on crushing him under their mighty clubs. Deb shot one of the giants, his well-placed shot ensuring that Lo-kag would not be struck by accident instead. It screamed in pain and tried to reach behind to dislodge the arrow stuck in its back. Lo-kag, while still on the ground, found himself surrounded by three hill giants. He hefted his greataxe and struck at a giant’s knee, which shattered on impact. The giant howled in pain then struck the goliath with its club, causing Lo-kag’s legs to almost buckle from the tremendous force of the attack. Lo-kag was covered in his own blood and it felt like every bone and muscle in his body was on fire. Dred ran over to where Therand stood. “Lo-kag’s not going to make it if we don’t kill those giants fast,” he said. He let loose two arrows—one after the other. One arrow struck a giant in the eye, while the second arrow struck it in the leg. The giant howled in pain as it clutched its eye. Its leg also gave way, causing the giant to fall on one knee. Deb and Therand both shot at the giants, their arrows striking true. The giants, although badly wounded stil had fight left in them. Grunting in pain, one of the giants raised its club and brought it straight down at Lo-kag. The impact forced the goliath to the ground. Darkness swept over Lo-kag as he fell to the ground. Dred saw the barbarian drop. He quickly ran over to help his fallen comrade, careful to avoid the giants’ deadly reach. When he reached Lo-kag, Dred touched him by the arm and called upon primal powers which then accessed the deepest reserves of strength still beating within the unconscious goliath. Lo-kag’s body suddenly heaved as his body fought to regain consciousness. He opened his eyes. He saw Dred kneeling over him and heard the dwarf offer words of thanks to his dwarven gods. “You won’t be dying today, friend,” Dred said. Both looked up and saw the three giants standing nearby. Though severely wounded, all three were still very much alive and no less dangerous. Suddenly, a crackling clap of thunder reverberated through the area. Both Lo-kag and Dred were forced to shield their eyes from the nearly blinding light that briefly lit the surrounding trail. A powerful bolt of lighting, unleashed by Caldreas bore down on all three giants. Two were struck while a third was fortunate enough to miss the bolt’s deadly effects. When it was over, one giant lay dead on ground. Smoke curled up from its still form. A second stood badly wounded with burnt marks covering most of its body. Lo-kag quickly got up, uttered a war cry and charged at the wounded giant. His greataxe buried itself deep into the giants’s leg. The giant screamed as blood poured out of the gaping wound. It then toppled, dead, to the ground. Dred raised his crossbow and aimed it at the remaining giant who decided to run rather than fight. His shot took the giant in the leg. The giant’s leg collapsed and he fell to the ground, howling in pain as he tried to pull the bolt from out of his leg. Deb, seeing the the giant fall to the ground, took aim and fired two arrows at it. Both arrows found their target, killing it instantly. With the battle won, the group gathered themselves together. Lo-kag did what he could to bandage his wounds while the others searched the area. In the wreckage of the wagon, they found a silk handkerchief with the initials, “ZC”, embroidered with gold letters. Everyone but Deb recalled Kira, the innkeeper of Bear’s Head Inn, asking them to travel to New Hluthvar to find out what may have happened to her Cormyrean merchant friend Zandor Caskerhill. Caskerhill had paid a wizard to cast a spell, and delivered a message to Kira announcing his intention to visit her soon. Kira became worried when Caskerhill had not arrived at the appointed day he said he would. Since Caskerhill’s body was nowhere to be found, the group suspected he may have been taken prisoner, like the dwarves from Hammerfist Hall. On the giants they found a necklace of animal fangs, a carved wooden idol which resembled some unknown figure, a half empty cask of ale, and necklace of mummified fingers. Close examination revealed that the fingers were dwarven fingers. “Are they the ones who attacked the caravan?” Caldreas asked. “Then let’s see where they came from,” Deb said. He stood and started to walk southeast, deeper into the Far Hills.